Xu Zhangle and her husband and their two children are a typical middle-class couple from Shenzhen, and along with 60 other Chinese families, they are going on an extended holiday to Thailand in July, where they hope to enjoy an immigrant-like life experience. 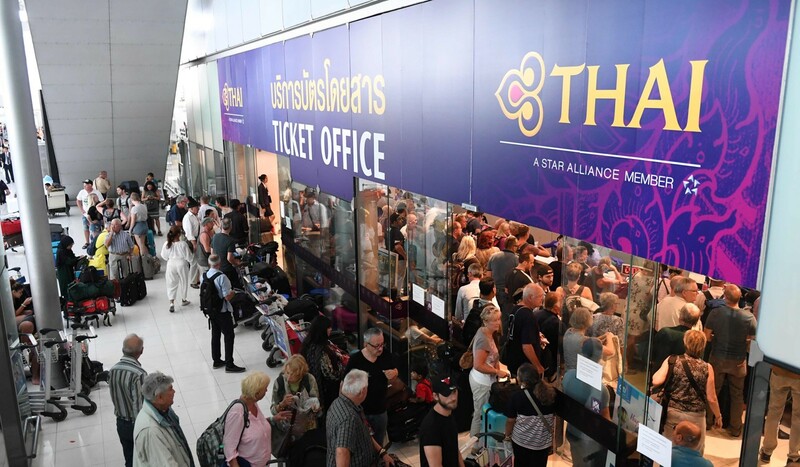 The family have paid a travel agent around 50,000 yuan (US$7,473) for the stay in Chiang Mai in the mountainous north of the country, including transport, a three-week summer camp for their daughters at a local international school, rent for a serviced apartment and daily expenses. Zhangle loves Chiang Mai’s relaxed lifestyle and easy atmosphere and wants to live as a local for a month or even longer, instead of having to rush through a short-term holiday. “It would not be just [tourist] travelling but rather a life away from the mainland.” she said. Recently, upper middle-class citizens have increased their efforts to safeguard their wealth and achieve more freedom by spending more time abroad. They have invested considerable amounts of money in overseas properties and applied for long-stay visas, although many of their attempts have ended in failure. Chinese citizens are encountering more barriers to their dreams of travelling abroad, with severe limits on moving money overseas and restrictions on visiting foreign countries. Still, growing anxieties about air pollution, food and medicine safety and an increasingly authoritarian political climate are pushing middle class families to look for new ways to circumvent the obstacles so they can live outside China. Among the options, there is growing demand for sojourns abroad of a month or more, to enjoy a foreign lifestyle for a brief period to make up for the fact that their emigration dreams may have stalled. “I think this is becoming a trend. Chinese middle-class families are facing increasing difficulties to emigrate and own homes overseas. On the other hand, they still yearn for more freedom, for a better quality of life than what is found in first-tier cities in China. They are eager to seek alternatives to give themselves and their children a global lifestyle,” said Cai Mingdong, founder of Zhejiang Newway, an online tour and education operator in Ningbo, south of Shanghai. Now, many well-to-do Chinese middle class families can get a tourist visa for five or even 10 years that allows them to stay in a number of countries — including the United States, Australia, Canada, New Zealand and other Asian countries — for up to six months at a time. 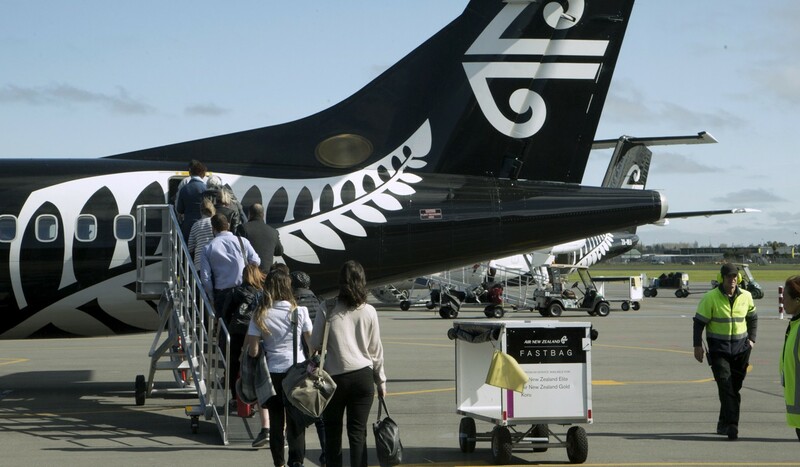 “In 2011, a round-trip air ticket from Shanghai to New Zealand cost 14,000 yuan (US$2,000), but now is about 4,000 (US$598),” added Cai. This opens up the possibility for many middle-class families who are not eligible to emigrate, to live abroad for short periods of time. Chinese tourists made more than 140 million trips outside the country in 2018, a 13.5 per cent increase from the previous year, spending an estimated US$120 billion, according to the China Tourism Academy, an official research institute under the Ministry of Culture and Tourism. “In [the Thai cities of] Bangkok and Chiang Mai, there are more and more Chinese who stay there to experience the local lifestyle, which is different from theirs in China. The life there is very different from that in China,” said Owen Zhu, who now lives in the Bangkok condo he bought last year. “The freedom, culture and community are diversified. The quality of air, food and services are much higher than in first-tier cities in China, but the prices are more affordable. A one-bedroom apartment in Shenzhen in southern China is twice as expensive, with rents continuing to rise rapidly. Both Cai and Zhu said they discovered the new phenomenon among China’s middle class and decided it was a business opportunity. Zhu is in the process of registering a company in Bangkok and plans to build an online platform to service the needs of Chinese citizens living abroad who do not own property or have immigration status, especially members of the LGBT community. Cai said dozens of Chinese families in the Yangtze River Delta had paid him to send their children to schools in New Zealand or Europe for around three or four weeks in the middle of the school year, while the parents rent villas in the area, with New Zealand and Toronto in Canada among the most popular destinations. Last year, Zheng Feng, a single mother and freelance writer from Beijing, rented a small villa in Australia for a month for them, a friend and their children to escape Beijing’s pollution and experience life overseas. “To be honest, I don’t have enough money to invest in a property or a green card in Australia. But it’s very affordable for me and my son to pay about 30,000 yuan (US$4,484) to live abroad for one or two months.” Zheng said. Zheng will join the Xu family in Chiang Mai later this year and she is also planning a similar trip to England next year. Zheng’s friend, Alice Yu, invested in an American EB-5 investor visa a few years ago, and plans to make one or two month-long trips abroad each year until her family is finally able to move to the United States. Demand for the EB-5 investor visa in China seems to be waning given heightened uncertainty about the future of the programme and US immigration law in general under US President Donald Trump. Approval for the visa can now take up to 10 years, resulting in a huge backlog that has further dampened interest and led to a significant dip in investment inflows into the US from foreign individuals. “Maybe it will soon become standard for a real Chinese middle-class family to have the time and money to enjoy a long stay at a countryside villa overseas,” said Yu. Karen Gao’s son started studying at an international school in Chiang Mai in June, at the cost of about 70,000 yuan (US$10,462) a year, after she quit her job as a public relations manager in Shenzhen and moved to Thailand on a tourist visa. “A few months each year for good air, good food and no censorship and internet control, but cheaper living costs compared to Beijing, it sounds like a really good deal to go,” said Gao, who has now been offered a guardian visa to accompany her son, who has already been given a student visa. “In Shenzhen, I wasn’t able to get him into school because I had no [local] residence permit. Last year, Gao, like thousands of other private investors mostly middle class people living in first-tier cities, suffered significant losses when their investments in hotels and inns in Dali, Yunnan province, were demolished amid the local government’s campaign to curb pollution and improve the environment around Lake Erhai. “We were robbed by the officials without proper compensation,” Gao said. 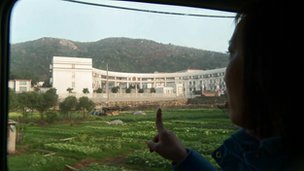 BBC: “A Chinese woman is suing a local authority who sent her to a labour camp for the loss of her personal freedom. Tang Hui was sent to a re-education camp by Yongzhou’s local authority for “disturbing social order” last August, state-run news agency Xinhua reported. She had been campaigning for harsher punishments for the seven men who raped and kidnapped her daughter, and forced her daughter to work as a prostitute. Her case sparked a public outcry, and she was released after nine days. Tang Hui is suing the Yongzhou authorities for 1,463.85 yuan ($236, £152) for her detention, Xinhua news agency reported. via BBC News – China labour camp victim sues local authorities. Xinhua News Agency on Saturday unveiled its list of the year’s 10 most attention-grabbing events in China. At its annual session in March, the National People’s Congress, China’s parliament, adopted the government work report, in which the country lowered its GDP growth target to 7.5 percent this year after keeping it at around 8 percent for seven consecutive years. The change was made in the face of global turbulence and pressing domestic demand for economic restructuring. The State Council in March issued an implementation plan for reforms in the health and medical care sector in the next three years. According to official statistics, as of the end of 2011 the basic medicare insurance system covered over 1.3 billion people in China, more than 95 percent of the total population, marking the realization of the previous three-year target for the 2009-2011 period to form a universal medicare system. The Central Committee of the Communist Party of China (CPC) on April 10 decided to suspend Bo Xilai’s membership in the CPC Central Committee Political Bureau and the CPC Central Committee, as he was suspected of being involved in serious discipline violations in the cases of Wang Lijun and Bogu Kailai. The CPC Central Commission for Discipline Inspection put him under investigation. Bo was later expelled from the CPC and public office and the case was turned over to prosecutors for investigation. In August, Bogu Kailai was sentenced to death with a two-year reprieve for intentional homicide by the Hefei City Intermediate People’s Court in Anhui Province. In September, Wang Lijun was sentenced to 15 years in prison for bending the law to selfish ends, defection, abuse of power and bribe-taking by the Chengdu City Intermediate People’s Court. 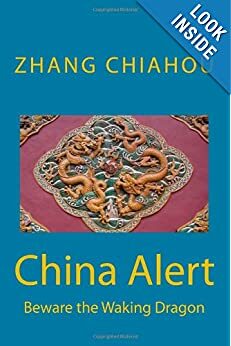 In response to some foreign countries’ actions infringing upon China’s maritime rights and interests in the South China Sea and East China Sea, China has vigorously launched campaigns to protect its legitimate rights. Since April, China has dispatched government ships and planes to monitor Huangyan Island in the South China Sea. 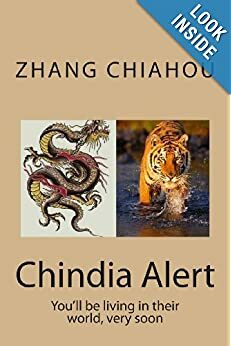 Five months later, the Chinese government announced the base points and baselines of the territorial waters of the Diaoyu Islands and their affiliated islets and started continuous patrols in waters around the Diaoyu Islands. In December, China reiterated its claims in the East China Sea by presenting to the UN Secretariat its Partial Submission Concerning the Outer Limits of the Continental Shelf beyond 200 Nautical Miles in the East China Sea. 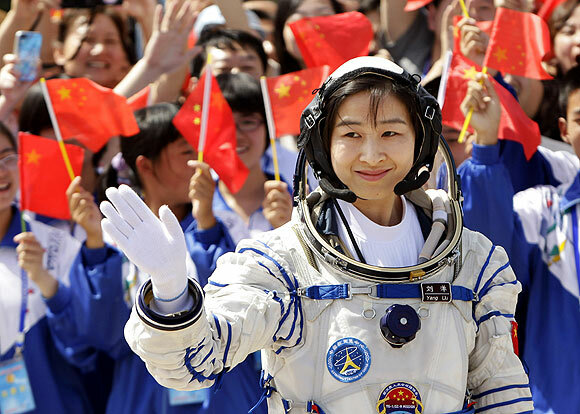 In June, China sent three astronauts, including the country’s first female astronaut, Liu Yang, into space for the nation’s manned space docking mission. The three astronauts successfully completed an automatic and a manual docking between the Shenzhou-9 spacecraft and the orbiting Tiangong-1 lab module in space before making a safe return to Earth. Also in June, China’s manned submersible, the Jiaolong, set a new national dive record after reaching 7,062 meters below sea level during its fifth dive in the Mariana Trench in the Pacific Ocean. In September, China’s first aircraft carrier, the Liaoning, was delivered to the People’s Liberation Army Navy and put into commission after years of refitting and sea trials. Last month, the country successfully conducted flight landing exercises on the aircraft carrier, where the home-grown J-15 fighter jet made its debut in a landing and take-off exercise. The CPC convened its 18th National Congress between Nov. 8 and 14, when the Party’s new leadership was elected, including Xi Jinping, who was elected general secretary of the CPC Central Committee. The congress also set new targets for the country such as efforts to complete the building of a moderately prosperous society in all respects. The Ministry of Human Resources and Social Security announced in November that China’s urban and rural pension insurance systems covered 459 million people at the end of October and that as many as 125 million elderly people receive monthly pensions. The State Council had previously decided to make pension insurance available for everyone in urban and rural areas. The newly-elected leadership of China’s ruling party has pledged to reject extravagance and reduce bureaucratic visits and meetings, in a bid to win the people’s trust and support. via Xinhua unveils top 10 domestic events of 2012 – Xinhua | English.news.cn. Having seen the success of ‘nail house’ resisters in gaining better compensation, we now have ‘nail graves’. Wonder what will come next. SCMP: “A villager refusing to concede to a property developer’s demands to move a family gravesite off a piece of land left construction workers no choice but to dig around the grave, leaving behind a bizarre sight that has since spread on social media. The solitary grave, which now sits on a mound of earth 10 metres off the ground in the middle of a construction site in Taiyuan, Shanxi province, has been given the term “nail grave” by netizens. The term is a play on “nail house”, which was coined by developers for homes belonging to people – “stubborn as nails” – who refused to move even after being offered compensation. Media reports speculate that developers had offered to pay about one million yuan (US$160,400) to move the grave and headstone. The construction site, which once served as a public graveyard for local villagers, is giving way to a residential complex expected to be completed in April. Since construction started in 2009, most villagers had already moved their family’s graves after compensation agreements with the developer. In the face of China’s rapid economic development, Chinese property developers have been meeting much greater public resistance to what many see as forced land-grabs. Most are compensated with amounts less than their property’s net worth. “Nail graves are an inevitable product of our country’s progress…the souls of the dead can not rest in peace,” wrote one blogger on Sina Weibo, China’s main microblogging site. Although China has long encouraged cremation due to an alleged shortage of land for burials, ancestors are traditionally held in deep respect and many in the countryside continue to construct tombs in accordance with culture. 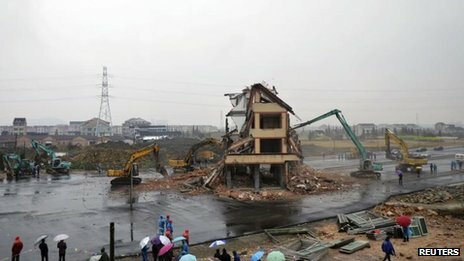 via Defiant villager leaves developers stumped over gravesite | South China Morning Post.